CWIEME Berlin - the world's leading exhibition for the transformer and electric motor manufacturing industries - opened its doors to international visitors for three days of networking, presentations and workshops. InnoEnergy, Europe's sustainable energy innovation engine, is making its Investment Round, for supporting and launching revolutionary clean energy innovations, open year-round to offer flexibility to businesses to shorten the journey from lab to launch. Workshop on off-grid energy supply being held in Bavaria for the fifth time. Built on decades of engineering experience with power electronics, SOLAR WARE SAMURAI™ inverters offer the industry's most advanced grid management in an efficient, compact footprint. The new inverters will be available in mid-2017. Holland's largest rooftop PV plant operational. 06/29/17, 05:50 AM | Solar & Wind, Energy Storage & Grids | KACO new energy Inc. 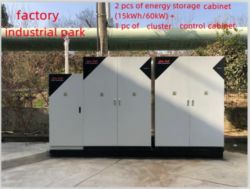 Sustainable energy use in industry with inverters from KACO new energy. POWER-GEN Europe and Renewable Energy World Europe, the leading conference and exhibition for the international power and renewable industries, celebrated a successful second day. The show, which is the largest of its kind in Europe, provided expert industry insight and an exciting programme of debate to over 9000 visitors at the Koelnmesse in Cologne, Germany.